Dr. Jan Kaslin from Monash University's Australian Regenerative Medicine Institute (ARMI), used the zebra fish model of nerve regeneration. Zebrafish are small, tropical fish that are known as "master-regenerators" because they have the capacity to regenerate many tissues or organs following injury, and being see-through scientists can literally watch the regeneration within the living fish. Dr. Kaslin and colleagues isolated a group of precursor cells and stem cells that very quickly colonise and regenerate the fish's spinal cord when it is damaged. Using confocal and light sheet microscopy Dr. Kaslin and colleagues were able to track and image the regeneration of living nerves in real time – allowing the first glimpse into how these precursor and stem cells move, behave and repair the spinal cord. Dr. Kaslin has been able to watch, and film, the rapid process – which can take as little as two days to restore movement in zebra fish larvae and within 2-4 weeks in the adults. "It's remarkable how quickly these fish regain their capacity to swim after injury," Dr. Kaslin said. 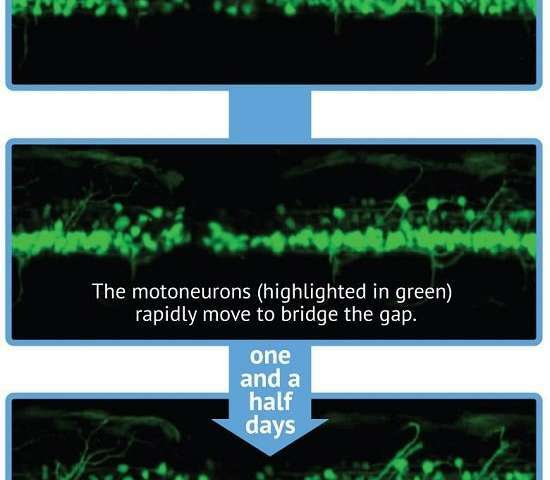 The researchers identified two "waves" of cell regeneration: the migration of neural precursors to the injury – which led to rapid recovery of movement – followed by the activation of stem cells in areas surrounding the injury site. "It may be possible to learn how to turn these same switches on in humans who have had spinal cord or brain injury," Dr. Kaslin said. The study opens the way to learning how to trigger the central nervous system in humans to regenerate, according to Dr. Kaslin.